You will have been directed to the website after your first visit to obtain some information in order to make informed choices at your second visit. You will be given a written report of findings (ROF) and choices of levels of care. This is usually split into the 3 areas: Relief care, Rehabilitative care and Wellness care, all as distinct steps. The chiropractor will also go over your x-rays. If you opt to start relief care, you will be adjusted at a frequency either everyday, 3 times/wk, 2 times/wk, or once per week until relief of your presenting complaint. If there is no change after 6 visits a mini re-exam will occur and a full re-exam at 12 visits. 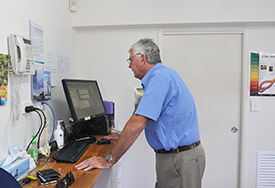 Upon arrival, the chiropractic assistants will check you in and you will be seen by one of our chiropractors promptly. We do our best to see patients within 7 minutes of their scheduled time. As chiropractors in Mt. Warren Park we pride ourselves on running on time. If a patient requires more time, we then offer patients an opportunity to see one of the other chiropractors. Contact us on (07) 3287 2666 for more information!